Bangalore has a lot to offer, being the Silicon Valley of India. It has a vibrant nightlife and a rich cultural background. But there are times when you just have to get away from the city. There are a large number of interesting places to visit within 100 kilometres of the city. So you can head out to one of them and get back home the same day. Here are the best options for one-day trips from Bangalore. In the Gundlupet taluk of Chamarajanagar district is Bandipur National Park, a great place to spend the day. Particularly if you enjoy safaris, head over early (it’s 220 kilometres away from Bangalore) to catch the 6:30 am safari. Alternately, you could stop by 3 pm onwards to see this place, the largest protected area in South India (along with Nagarhole National Park, Mudumalai National Park and Wayanad Wildlife Sanctuary). A fascinating site, it contains the largest habitat of wild elephants in South Asia. The bird sanctuary of Kokkare is 12 kilometres from Maddur towards Halagur. The sanctuary happens to be one of the few places where spot-charged pelicans nest. The sighting of the spot-charged pelican is considered quite auspicious amongs the locals, so much so that the village has been named Kokkare, which translates to crane. The bird attracts birdwatchers from all over the world. Given the importance of the bird, the government has taken various measures to secure the region from poachers. The Biligiriranga Hills, otherwise knowns as BR Hills, is a hill range situated at the tip of the Nilgiris, connecting the Eastern and Western Ghats. The area is surrounded by plush greenery and also has a wildlife sanctuary called Biligiriranga Swamy Temple Wildlife Sanctuary, which is a protected reserve. The sanctuary plays host to a diverse and varied flora and fauna. The sanctuary also has majestic Bengal tigers and around 26 species of mammals, ranging from the Asian elephant to the barking deer. The natives here belong to the Soliga Tribe and the tribesmen celebrate the annual Ratha festival in April. Bannerghatta National Park (open from 9 am to 5 pm) is one of those parks that absolutely can’t be missed while in Bangalore. The park plays host to a variety of wildlife, from elephants to Bengal Tigers. The park also doubles as a sanctuary for elephants as well as the endangered species of tiger. The ark is also blessed with a diverse fauna and is an unlikely destination for trekkers and adventure lovers. Avani is a small village in the Kolar district of Karnataka. Known for being home to some of the most famous temples in Karnataka, the village is prominent because of its association with the Indian epic Ramayana. Legend has it that Avani is where Sita gave birth to Luv-Kush. Another reason why it is so famous is that it is rumoured that the holy sage Valmiki also once resided over here. Avani is also known to be a gaya (a city of historical and monumental significance) of South Indian temples and attracts a large number of tourist every year. Besides the temples, Avani is also a popular destination for rock climbing and trekking. The Ranganathaswamy Temple is a pilgrimage site and an important monument. It was built in the early 12th century by Chola king Krishnadevaraya and was later renovated in the 16th century by the Wadiyar king Jayachamaraja. This temple is said to be one of the crown jewels of the Chola dynasty and is considered to be the holiest of sites by many locals. Talakadu is situated on the banks of the river Cauvery, The area is steeped in legend and is known for its temples, buried under sand dunes. It is said that a queen cursed the land to be forever buried in sand before taking her own life. These sand-covered temples, situated on the banks of the Cauvery, are excavated once in 12 years for special worship. Undoubtedly an ideal day trip from Bangalore. The ideal time to visit is during the day between September and February. Hassan is a quaint city. Since it hasn’t been visited by many tourists, it is the perfect spot for a peaceful picnic with your family. Hassan lies between the Malnad and Maidan areas of Karnataka. The city is named after the Kul goddess Hasanamba, which when translated from the colloquial dialect means Smiling Mother. The city is also home to antiquated structures and landmarks and is called the temple architecture capital of Karnataka. Bilikal Rangaswamy Betta is a popular trekking site and is very close to Bangalore. Bilikal Betta literally means white rocks and you will find that the area is surrounded by plenty of them. It lies in the Eastern ghats and is also filled with shrubs that bring this place one step closer to nature. A diverse wildlife can also be spotted amongst these hills, particularly elephants. At the rocks, you can have a panoramic view of the outskirts of Bangalore. The best time to visit the hills is during the monsoon. Do we even need to mention this one? Nandi Hills or Nandidurga is a popular hill station near Bangalore that attracts a lot of visitors every year. Known by many just for the scenic drive from Bangalore, Nandi Hills derives its name from the nearby village of Nandi. Nandi also houses the famous Bhoganandishwara Temple, which you can visit en route to the hills. Nandi Hills was once the summer retreat of Tipu Sultan, who would venture out from his home to view the spectacular sunrise and sunset from the pinnacle of the hills. Nandi Hills also attracts a lot of birdwatchers and photography enthusiasts. There is also a vineyard in the vicinity (Grover Vineyards) that you can visit. You can learn about what goes into making wine and even taste a few samples! The waterfall derives its name from two Kannada words, hoge (meaning smoke) and kal (meaning rock), which is a reference to the misty appearance the waterfall gives out as massive amounts of water clash against the rocks. The waterfall is formed when the Cauvery River enters the state and descends into the elevated landscape, forming the Hogenakkal Waterfall. Visitors can swim in the lower reaches of the falls and also take photos of the scenic waterfalls. The local forest department is in charge of the upkeep of the waterfall and in the off season they even allow coracle riding to take place in the lower tredges of the waterfall. There is also a mini zoo and a park to entertain visitors who don’t feel like visiting the waterfall. Big Banyan Tree is an acclaimed vacation destination in Bangalore. As the name suggests, it is a massive Banyan tree that is spread across five sections of land. The tree is almost four hundred years old and is a prime example of nature’s altruistic abundance. There are provisions around the tree so that families can come here and spend a peaceful day here under the Banyan tree’s nurturing presence. A good place to ride to on a bike from Bangalore. Anthargange is a rocky area four kilometres from Kolar. It is a popular trekking spot. Anthargange literally means “Ganges from the deep” in Kannada. It is surrounded by seven villages, standing amongst the granite rocks and has boulders scattered all around. 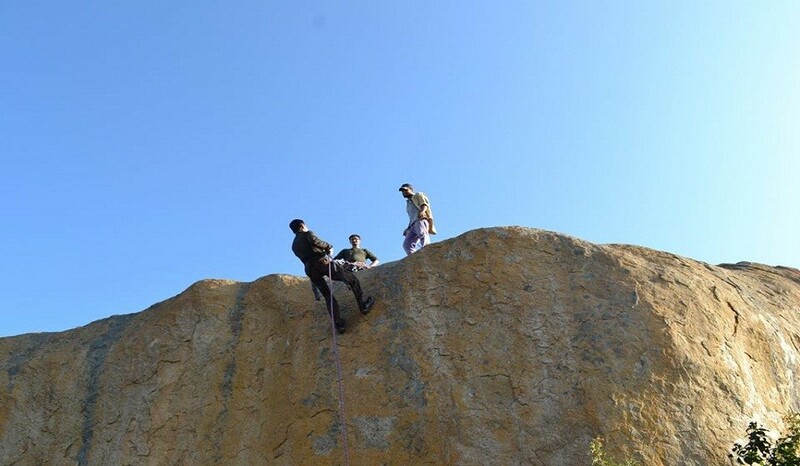 During the day, one can indulge in activities like rock climbing and rappelling owing to the rocky terrain provided by the boulders. The area also has a lot of caves that have been formed due to the volcanic activity in the past. Spelunking and cave exploring are other activities that are popular in these caves. Kunti Betta is a trek that garners the attention of local trekkers as well as adventure enthusiasts from all around the world. The trek trails leads you through two rough hills to the town of Pandavapura, which overlooks the beautiful Pandavapura Lake. Legend has it that the Pandavas had taken shelter among the hills during their exile. They developed quite a fondness for these hills and hence the town and the hills have been named after them. That’s it from us for one day trips from Bangalore. Do you know of any other places that you can head to and back on a single day from Bangalore? Surely, you know of a few others. If you think there are any important ones we’ve missed out on, do let us know in the comments section.